Mike has been accorded the highest Peer Review Rating by Martindale-Hubbell: AV Preeminent. 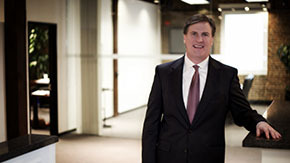 First building a reputation as a commercial and business litigator in the big-firm setting before co-founding FSC in 1993, Mike has continued to enhance that reputation through multiple courtroom victories over the years. Over the past decade, along with co-founder Jon Suder, Mike has gravitated toward a practice centered on intellectual property litigation in cases throughout the country, while still handling select commercial and business cases. An early victory in the patent infringement arena included a seven-figure verdict against a multinational oil company, as reported by The National Law Journal and also by The Blue Sheet. For a video that takes a closer look at FSC’s IP-litigation practice, see here. The tenacity that Mike brings to every case is mirrored by the tenacity that has seen him compete in five marathons around the country, including the 2012 Tucson Marathon. His finishing time there qualified Mike for the 2014 Boston Marathon. Mike is rated AV Preeminent®, the highest Peer Review Rating™ by Martindale-Hubbell®.